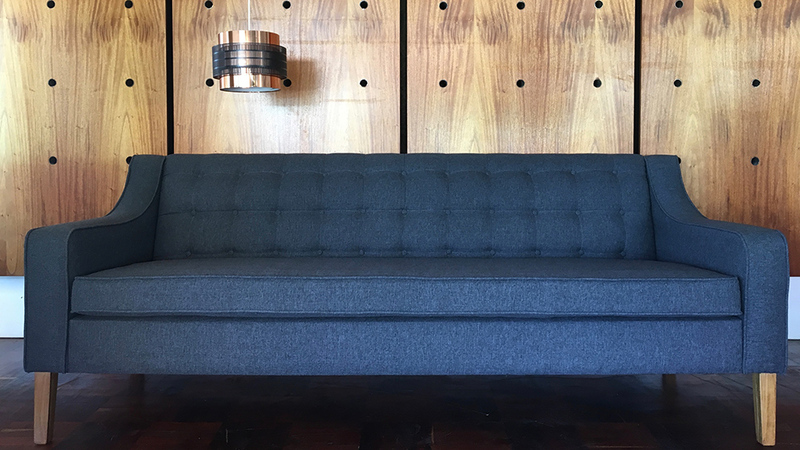 THE LINCØLN IS A COHESIVE FUSION OF THE CLASSIC CHESTERFIELD AND 50S VINTAGE DESIGN. THIS IS ACHIEVED BY EMPLOYING THE USE OF BUTTON BACK, PIPING AND TOP STITCH DETAILING. ELEGANT AND REGAL, IT IS TIMELESS AND NEVER GOES OUT OF FASHION. THE FRAME IS HANDMADE OF SOLID WOOD AND THE LEGS ARE SOLID KIAAT. ITS ARCHITECTURE CONSISTING OF A FIXED BACK AND LOOSE SEAT CUSHION PROVIDES A RELAXED UPRIGHT SEATING POSITION. THE SØFA IS A STYLISH CONTEMPORARY COUCH WHICH COMBINES DESIGN AND FUNCTIONALITY. BUILT FOR COMFORT BUT UNCOMPROMISING ON LOOKS. THE FRAME IS HANDMADE OF SOLID WOOD AND THE LEGS ARE SOLID OAK. IT FEATURES A MEDIUM-DENSITY FOAM SEAT WITH A FAUX FEATHER BACK CUSHION FOR ULTIMATE SEATING PLEASURE THAT ALSO LOOKS GOOD. THE MØD IS A CLASSIC EXAMPLE OF DANISH MID-CENTURY DESIGN. IT IS UNDERSTATED AND SOPHISTICATED. WITH HARMONIOUS LINES AND PROPORTIONS, PLACED ANYWHERE IN YOUR ENVIRONMENT, IT WILL COMPLEMENT YOUR AESTHETIC. THE FRAME IS HANDMADE OF SOLID WOOD AND THE BASE IS SOLID KIAAT. A SUPERIOR QUALITY HIGH-DENSITY FOAM IS USED TO PROVIDE OPTIMAL SUPPORT AND DURABILITY THAT RETAINS ITS SHAPE.